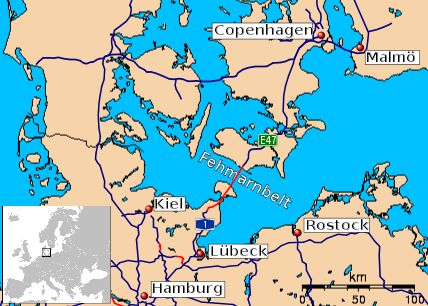 Whether to join the German island of Fehmarn with the Danish island of Lolland just 17.6 km away with a bridge or a tunnel has been the subject of discussion for quite some time, and now it has been decided that a tunnel will link the two. The tunnel will commence operation ten years from now, at which time most boat traffic between the two islands will cease. Had a bridge been decided upon, it would have been the ninth-longest in the world. As the tunnel will be financed by Denmark, Germany has no say in the project besides the role it will play in the environmental impact assessment of the project, which will happen in the spring of 2013. In fact, this is one of the reasons for the decision to go with the tunnel as it would take but two years to construct and would have no effect on the marine life in the area. In spite of this though there is a lot of protest against the project on the island of Fehmarn due to how they see it affecting the environment, and revenues. If a fixed link is built between the two islands then the drivers that currently spend some time in the neighborhood waiting for the ferry to arrive will no longer stop, and tourist revenues would shrink. Now let's see what some of the comments below the article say. Im Hochgeschwindigkeitszug nach Skandinavien. Toll. To Scandinavia by high-speed train. Great. Besser hier die Milliarden investieren als sie wieder für Integration verpuffen zu lassen. Better to spend the billions here than to let it fizzle out again on integration. Hoffentlich wachen die Dänen auf und schließen die Grenze nach Deutschland. Hopefully the Danes wake up and close the border to Germany. Auch an diesem Projekt werden unsere GRÜNEN wieder etwas zu meckern finden !!! Of course our GREENS find something to grumble about with this project too!!! That last comment was mostly voted down.